Please Spanish students, make mistakes!. Please Spanish students, make mistakes! As I mentioned last week, I started teaching a new conversation class for beginners to Spanish, which has inspired me to share a series of tips related to language learning. These tips will be geared towards students that are new to the language learning process, but could also be beneficial to the veterans. Tip #2 – Please, make mistakes! Generally speaking, the last thing we want as human beings is to make mistakes. We feel embarrassed, dumb, unprepared, etc. But when it comes to learning a language through conversation, mistakes are an important part of the process. 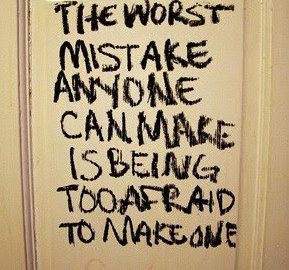 If you’re putting yourself out there and trying to communicate, you’re going to make mistakes. No one that is learning a language speaks it perfectly. No one. And if you actually want to learn to speak, you need to put yourself out there, therefore you will make mistakes. In addition to that, scientific research shows that we are more likely to learn from a previous mistake that we personally made, than from just being handed the correct information. So the next time that you think to yourself “I better not say anything because I’m not sure it’s right,” remember that perfection is not the goal in the language learning process; communication is. Pura Buena OndaPura Buena Onda BlogPlease Spanish students, make mistakes!